Only last week I had posted Alison Weir’s harrowing account of the strip-searching by Israelis of Palestinian women and children — some as young as 7-10 years of age. Despite its outrageous treatment of the Palestinians, Israel always manages to escape censure thanks to the diplomatic cover provided by the Euro-American alliance. Here the Guardian reports a British diplomat receiving a taste of the same treatment they have frequently defended as long as the victims were Palestinians. Janet Rogan, who is Britain’s consul general in Tel Aviv, was with a delegation of British Treasury officials, led by Ed Balls, the economic secretary to the Treasury, earlier this month. They arrived at the Jerusalem office of the prime minister, Ehud Olmert, ahead of a meeting with his chief of staff and his political adviser. The names of the visitors had been given in advance, the Yedioth Ahronoth newspaper said yesterday. But security guards ordered Ms Rogan to undergo a physical search, the paper said. She refused and presented her diplomatic identity card. However, she was then made to step behind a partition and to undergo a physical search, which included removing her blouse. The Yedioth described the search as a “prolonged, needless and humiliating process” and said the diplomat was visibly upset. Gregory Levey, a former speech writer for past Israeli governments, brings some interesting stories from inside the annual AIPAC conference ranging from the outrageous to hilarious, which highlight the almost total grip of the Israel Lobby on US foreign policy. “For those feeling apocalyptic about the turmoil in the Middle East” he writes, “ pastor John Hagee was there to greet them”. Many rank-and-file members of AIPAC seemed to be spoiling for military action against Iran — “We have to do to them what we did to Saddam,” one delegate told me — but AIPAC’s leadership remained strikingly circumspect about it…At times this put them at odds with the grass-roots delegates; Marvin Feuer, AIPAC’s director of policy and government affairs, was verbally attacked by a conference attendee as “weak” when he downplayed military options against Iran during a Q&A session. When the thousands of lobbyists descended on Capitol Hill, they were greeted by nearly every U.S. senator and more than half the members of the House of Representatives — approximately 500 meetings were held between AIPAC representatives and members of Congress on Tuesday alone. In addition to pushing for the sanctions plan, the goal was to showcase the strength of AIPAC and establish more ties for future communication and lobbying. The AIPAC activists were aided in their mission by some members of Congress themselves, who advised them how to reach out to their colleagues. For a long time, we have heard from Noam Chomsky and legions of others who parrot his every word that Israel is a “strategic asset”. If that is so, then should there be a need to keep stressing this point? While AIPAC itself has never been modest about its power, some, like As’ad AbuKhalil have suggested that like any other lobby they have an interest in exaggerating their power. Is that really so? Obama had recently said, “Nobody is suffering more than the Palestinian people” at a recent event in Iowa — a statement that served to anger some AIPAC delegates. Bush’s popularity ratings have recently dropped to record lows. The overwhelming majority of Americans seem to detest him. Is there anyone who still supports this man? Kudos to Mearsheimer & Walt for finally making discussion of the Israel Lobby’s inordinate influence over US foreign policy part of the mainstream debate. 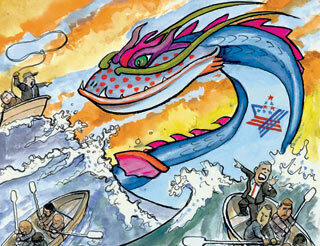 In “Taming Leviathan“, the Economist has a surprisingly critical look at the Lobby’s influence. THIS week saw yet another reminder of the awesome power of “the lobby”. The American Israel Public Affairs Committee (AIPAC) brought more than 6,000 activists to Washington for its annual policy conference. And they proceeded to live up to their critics’ darkest fears. They heard from the four most powerful people on Capitol Hill—Nancy Pelosi and John Boehner from the House, Harry Reid and Mitch McConnell from the Senate—as well as the vice-president (who called his talk “The United States and Israel: United We Stand”) and sundry other power-brokers…The display of muscle was almost equalled by the display of unnerving efficiency…The only discordant note was sounded by a group of a dozen protesters—Orthodox Jews in beards, side-curls and heavy black coats—holding up signs saying “Stop AIPAC”, “Torah forbids Jews dictating foreign policy”, and “Judaism rejects the state of Israel”. The lobbyists had every reason to feel proud of their work. Congress has more Jewish members than ever before: 30 in the House and a remarkable 13 in the Senate…Both parties are competing with each other to be the “soundest” on Israel. About two-thirds of Americans hold a favourable view of the place. Zbigniew Brzezinski, a former national security adviser, worries that America is seen in the Middle East as “acting increasingly on behalf of Israel”. Condoleezza Rice, the secretary of state, has compared the situation in Palestine to segregation, and argued that there could “be no greater legacy for America than to help bring into being a Palestinian state”. Philip Zelikow, her former counsellor, argues, in diplomatic language, that the only way to create a viable coalition against terrorists that includes Europeans, moderate Arabs and Israelis, is a “sense that Arab-Israeli issues are being addressed”. Nazareth. 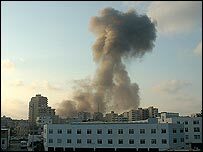 12 March 2007. Israel’s supposedly “defensive” assault on Hizbullah last summer, in which more than 1,000 Lebanese civilians were killed in a massive aerial bombardment that ended with Israel littering the country’s south with cluster bombs, was cast in a definitively different light last week by Israeli prime minister Ehud Olmert. A massive French battle tank swings its turret slowly from left to right, its cannon barrel pointing straight at Israel down below.About a dozen French peacekeepers from the United Nationals Interim Force in Lebanon (Unifil), stand by two other military vehicles parked along the road. The picturesque, lush green scenery, with rolling fields on either side of the border fence is deceptively peaceful. But a rare exchange of fire between the Israeli and Lebanese armies took place just a few hundreds meters away, 12 days ago, the first serious incident on the border since the conflict between Hezbollah and Israel ended six months ago. 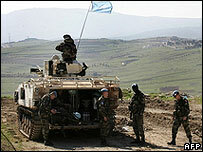 UN peacekeepers reinforced their presence in the area hoping to make sure it would be the last one. The reticent French soldiers had little to say other than “Tout est calme”, all is quiet. A Lebanese army jeep with a couple of officers drove past, heading further down the valley, closer to the border fence. Lebanese troops hadn’t had a presence in the area for decades, until UN resolution 1701, which ended the 34-day conflict, paved the way for the deployment of about 10,000 Lebanese and 11,000 more UN peacekeepers. That is why Hezbollah is feeling under pressure in south Lebanon. Under the UN resolution, only the Lebanese army and Unifil are allowed to carry weapons in the border area. Gone are the small Hezbollah positions and the yellow and green Hezbollah flags fluttering in the face of Israelis soldiers. But these were only the visible signs of the Shia guerrilla group’s presence along the border. 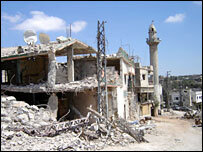 Hezbollah forces are still operational in the area, and they work hard to conceal their true strength. In the southern town of Bint Jbeil, a Hezbollah stronghold, still heavily scarred by the fighting, life is very slowly returning to normal. Kids play on the street, shops are full of fresh vegetable produce – but memories of the war are still vivid. “Everybody went to the gas stations to fill up on gas,” said Ali Faraj, recalling the latest border incident. “If anything happens, people will take off, no-one wants to get stuck here no more,” he says speaking English picked in Dearborn, Michigan, in the United States. Thousands of Lebanese emigrated to the US over the years and Dearborn is a popular destination for people from the south. Many of the locals, like Ali, say they don’t trust the UN peackeepers and see them as protecting Israel instead of Lebanon. In the last few days, a Spanish patrol was stoned by locals and French soldiers distributing medicine were kicked out by villagers in Maroun el-Ras by the border. The group’s vast social network is highly appreciated by locals. But if you’re not a Hezbollah supporter you can be left out. Tensions in south Lebanon about who should defend – and control – this region are amplified in Beirut where the political standoff continues between the government and the Hezbollah-led opposition. Although most people in the south still support the Shia group, the country as a whole is split down the middle and the rift is only widening. Olmert has told the Winograd Commission that his decision to respond to the abduction of soldiers with a broad military operation was made as early as March 2006, four months before last summer’s Lebanon war broke out. Unless our “moderate” Arab friends believe in Olmert’s clairvoyance, no further proof should be necessary that Israel’s aggression was premedictated. In a meeting in March, Olmert asked the army commanders whether operational plans existed for such a possibility, and they said yes. He asked to see the plans, and they asked why. He responded that he did not want to make a snap decision in the case of an abduction, and preferred to decide at that moment. The Commission ask Olmert why he decided “to carry out a large-scale ground operation in Lebanon, 48 hours before the cease-fire, in which 33 soldiers were killed”. 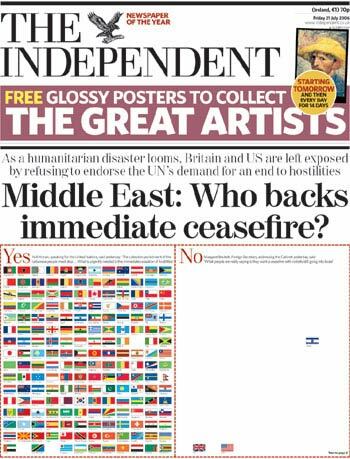 Olmert said he had wanted to influence UN Security Council deliberations so that the draft resolution 1701, calling for a cease-fire, would be amended in Israel’s favor. Olmert said that the morning he made the move, he had received a draft reflecting the French-Lebanese stance, which did not suit Israel. The expanded operation was aimed at pressuring the Security Council members, he said. Very clever, them two. Their strategy must have sent their popularity through the roof. In an opinion poll published this week, only 3% of Israeli voters said they would back Mr Olmert in an election, while 72% said he should resign. 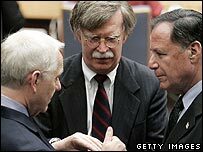 He said that as early as the first day of the war, U.S. Secretary of State Condoleezza Rice spoke with Olmert and asked that Lebanese Prime Minister Fouad Siniora not be undermined. Israel understood this to mean that Lebanese infrastructure should not be destroyed, even though the IDF had originally planned otherwise. Conal Urquhart’s usual substandard reports continue to reproduce official Israeli lingo, e.g. the soldier’s being “abducted” or “kidnapped”. However this time, he ventures at least one bold statement. Many suggested that the army had become accustomed to fighting the ill-equipped Palestinians and was not prepared for Hizbullah’s expertise. Yes, the Israeli army is a juggernaut, so long as it is confronted with stone-throwing pre-teens.